This Greek-inspired sauce looks vibrant, tastes delicious and is easy to make. 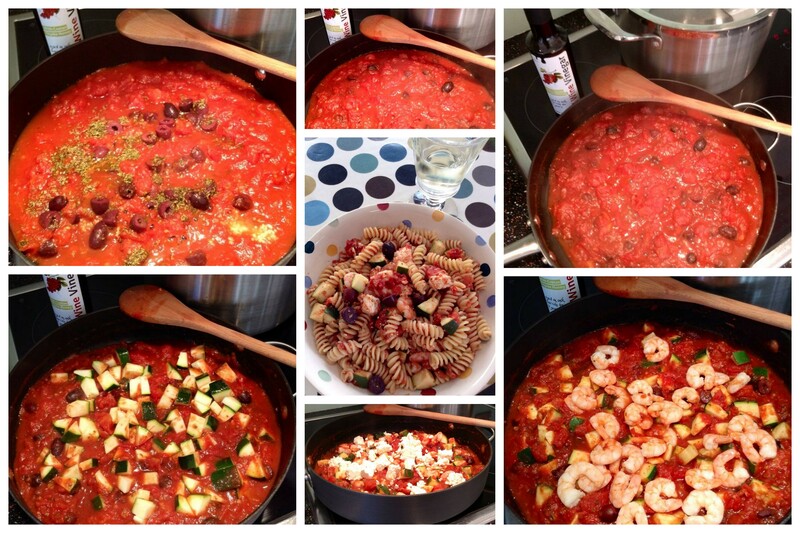 You can spoon it over pasta (I used fusilli here, but any pasta will do), rice or even couscous. It’s a great way to incorporate courgettes into your diet, if you don’t like them on their own. This sauce includes some of my favourite Greek ingredients, such as Kalamata olives, feta cheese and Olive Branch’s Red Wine Vinegar with Cretan Thyme Honey. You can use any red wine vinegar but the one from Olive Branch is my secret ingredient. It is made with the juices of Liatiko and Kotsifali grapes, which are then aged in oak barrels for 4 years. But here’s the secret… the grapes are mixed with Cretan thyme honey. The bees feed on the thyme plants so the honey picks up their aroma, which gives the red wine vinegar a tangy, sweet taste. Boil water for the fusilli in a large pot. Add 400g fusilli and cook as per package directions. 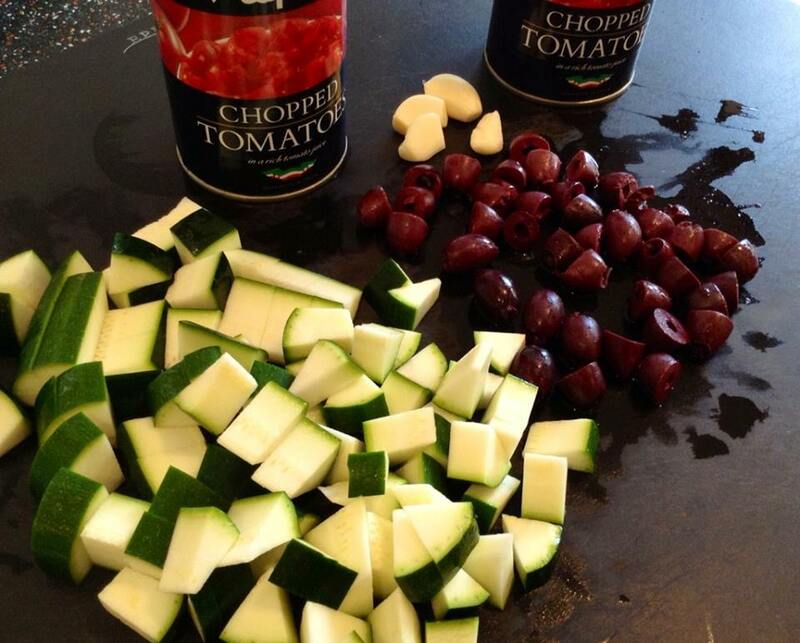 While the pasta is cooking, chop one medium courgette into cubes and 2 or 3 cloves of garlic. Slice a handful of pitted Kalamata olives in two. In a large skillet over medium-high heat, add two 400g cans of chopped tomatoes (and their juices), the sliced olives, chopped garlic, 1 tbsp sugar, 1 tbsp dried oregano and 1 tbsp red wine vinegar. Reduce heat to medium once the sauce starts bubbling. Boil gently, uncovered, until most of the liquid is evaporated, about 10 minutes. Stir often. Then stir in the courgettes and cook for another 5 minutes, until they soften. Add 160g peeled and cooked prawns and stir in the sauce to heat them through. 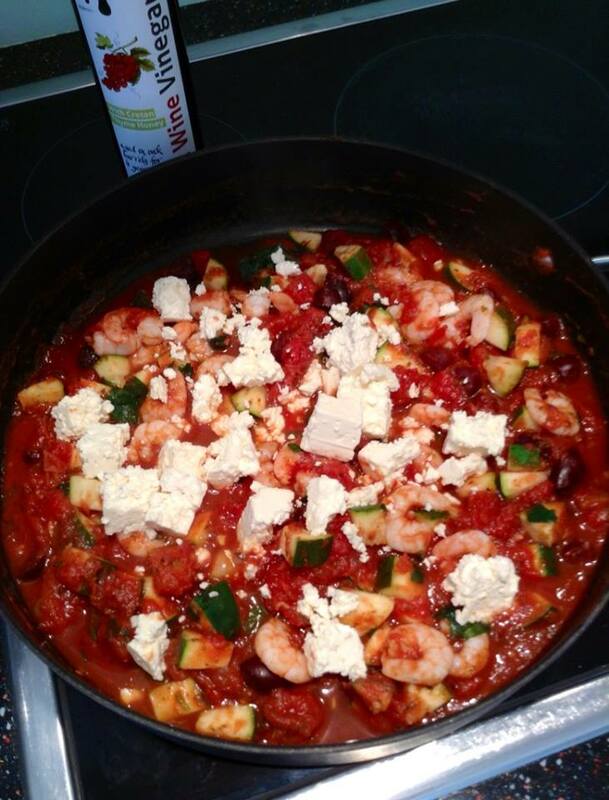 If you are using raw prawns, add them at the same time as the courgettes and cook until they are pink. Stir in chopped fresh parsley or dill, if you wish. 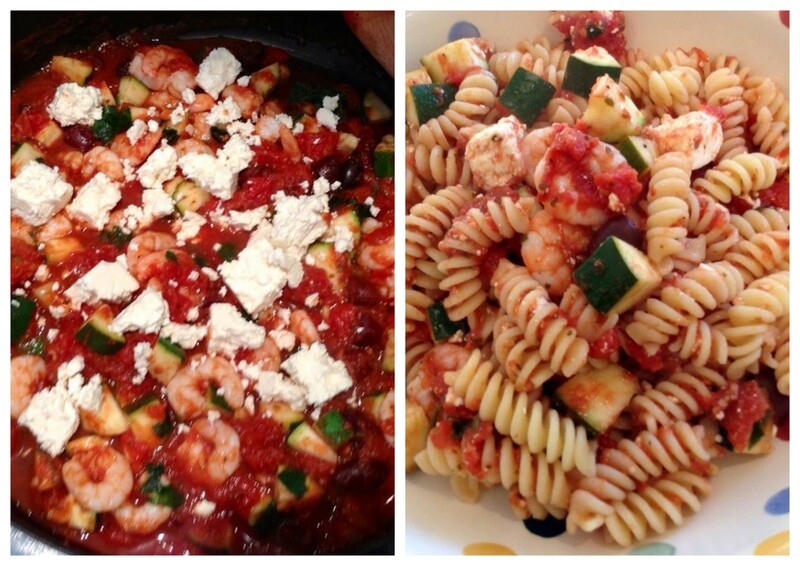 Crumble 100g of feta cheese into the sauce and stir to melt slightly. Drain pasta once it is cooked. Return to the large pot, then spoon sauce over the pasta and stir gently to combine the sauce and the pasta. Serve immediately. Makes 3-4 servings. 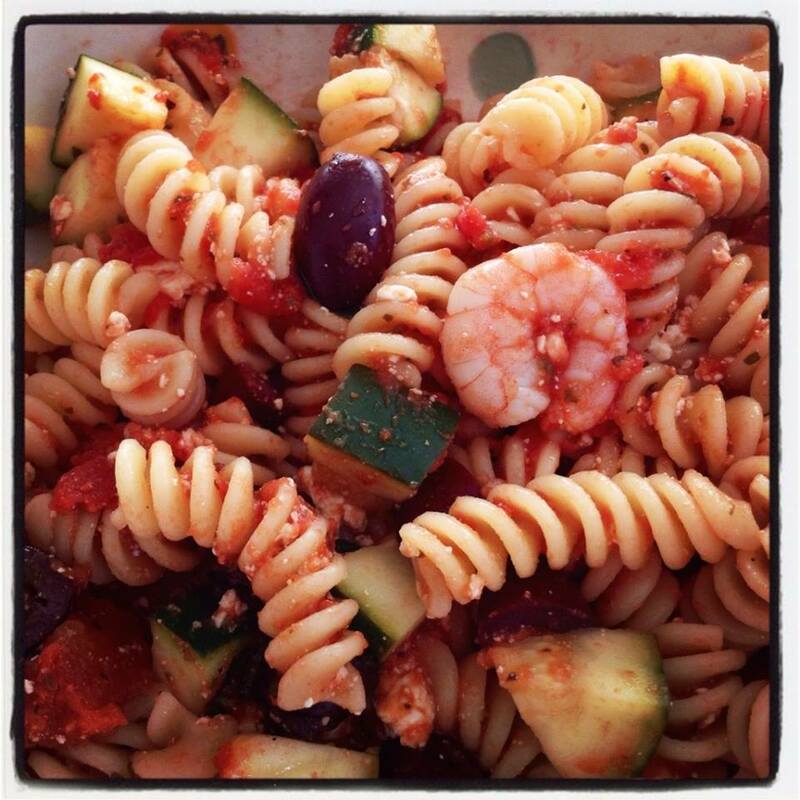 This entry was posted in Our Kitchen and tagged courgettes, feta, Fusilli, grapes, Greece, Greek, kalamata olives, Kotsifali, Liatiko, Olive Branch, Red Wine Vinegar with Cretan Thyme Honey, sauce, tomatoes, zucchini by One Two Culinary Stew. Bookmark the permalink.